LOUISVILLE, KY (WAVE) - They are two of the most storied programs in college basketball, and their pasts are intertwined. Legendary Kentucky head coach Adolph Rupp, the Baron of the Bluegrass, played at Kansas. Saturday in his namesake gym, Rupp Arena, his beloved Wildcats (15-3, 5-1 SEC) will host the #9 Jayhawks (16-3, 5-2 Big 12) in the SEC / Big 12 Challenge. The two schools have faced off 31 times with UK holding a 22-9 advantage. Kansas has won the last three meetings. Jayhawks head coach Bill Self is 6-4 against UK, but did lose to John Calipari and Kentucky in the 2012 National Championship game. 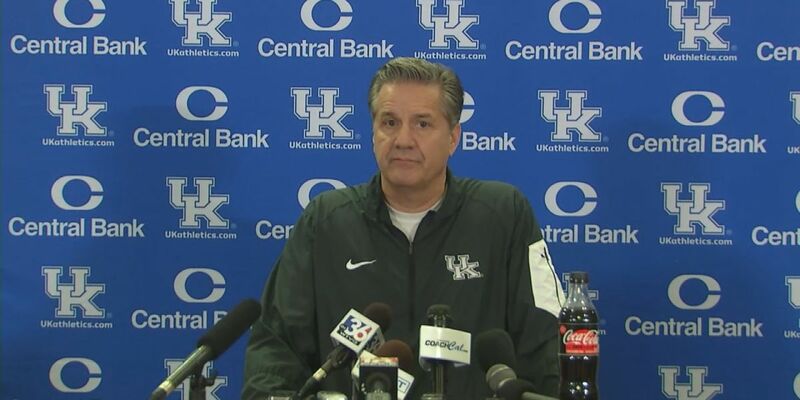 Kentucky has won five in a row, including back-to-back win over ranked opponents. An 82-80 win at #14 Auburn last Saturday and a 76-55 win over #22 Mississippi State on Tuesday night. ESPN College Game Day will be there and the game will be telecast on ESPN with tip off set for 6 p.m.